A new study of cancer data in England essentially replicated the results of the Philips et al study (see below). The study found that the two age groups most vulnerable to carcinogenic effects from cell phone use -- young and elderly adults -- showed increased incidence over time in brain cancer in the frontal and temporal lobes of the brain -- the two lobes that receive the greatest dose of microwave radiation when cell phones are used near the head during phone calls. However, Frank de Vocht, the author of this paper, rejected the explanation that cell phone use caused the increased cancer risk. He attributed the increased incidence to better diagnosis of brain tumors, especially in the elderly. Of course, this does not explain why the increase was only observed in the frontal and temporal lobes. He did not rule out the possibility that cell phone radiation may be a contributing factor to the observed increase. de Vocht F. Analyses of temporal and spatial patterns of Glioblastoma Multiforme and other brain cancers subtypes in relation to mobile phones using synthetic counterfactuals. Environmental Research. Available online 17 October 2018. https://doi.org/10.1016/j.envres.2018.10.011. Increases in excess of the counterfactuals for GBM were found in the temporal (+38% [95% Credible Interval -7%,78%]) and frontal (+36% [-8%,77%]) lobes, which were in agreement with hypothesised temporal and spatial mechanisms of mobile phone usage, and cerebellum (+59% [-0%,120%]). However, effects were primarily present in older age groups, with largest effects in 75+ and 85+ groups, indicating mobile phone use is unlikely to have been an important putative factor. There was no evidence of an effect of mobile phone use on incidence of acoustic neuroma and meningioma. This study, in agreement with other data from the UK and elsewhere, shows that the incidence of glioblastoma multiforme (astrocytoma grade IV) has increased significantly since the 1980s, especially in the frontal and temporal lobes and cerebellum. However, it further provides evidence that the trend of increasing numbers of newly diagnosed cases of glioblastoma multiforme in the temporal lobe (but likely in the frontal lobe and cerebellum as well) since the mid-1980s, although seemingly consistent with the hypothesis of exposure to radiofrequency radiation from mobile phones being an important putative factor, should to a large extent (if not exclusively) be attributed to another factor or factors; of which improvements in diagnostic techniques, especially in the elderly, seems the most plausible. Although these analyses indicate that it is unlikely that exposure to RF from mobile phones is an important putative factor, they also cannot exclude it as a contributing factor completely. It is therefore important to keep monitoring incidence trend data. Competing financial interests declaration: The author has previously done consulting for EPRI [Electric Power Research Institute], not related to this work. Financial support: No external funding was obtained for this study. A newly-published study of brain tumor incidence trends in England from 1995 to 2014 found that the trends over time varied by type of cancer, especially in the frontal and temporal lobes. The study found “a sustained and highly statistically significant” increase in glioblastoma multiforme (GBM), the most common brain cancer, across all ages. The rate of GBM more than doubled from 2.4 to 5.0 per 100,000 people. However, this increase was mostly hidden because the overall malignant brain tumor trend was relatively flat due to a reduced incidence of lower grade brain tumors. In England in 1995, when the tumor site was specified at the time of diagnosis, the frontal or temporal lobes of the brain accounted for 41% of malignant brain tumors. 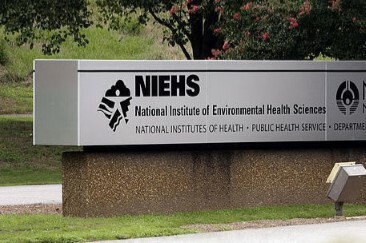 By 2015, these two sites accounted for 60% of the tumors. One cannot know from tumor registry data alone what caused these differential trends in brain cancer. 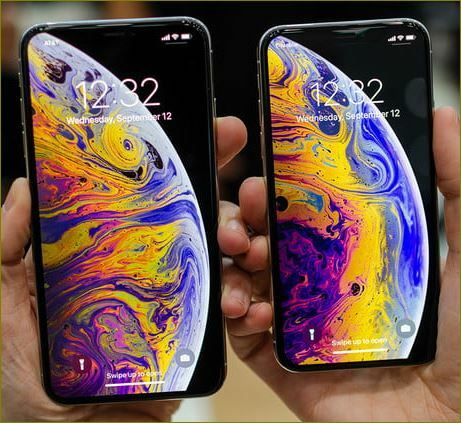 Based upon epidemiologic research, the most compelling explanation for the increased incidence in these deadly brain tumors, especially in the frontal and temporal lobes, may be exposure to microwave radiation due to widespread adoption of cell phones. However, the increased use of CT imaging scans is an alternative, but less compelling, explanation because far fewer people would have been exposed to this form of ionizing radiation. In the U.S., Zada and his colleagues (2012) obtained similar results in an analysis of national tumor registry data from 1992 to 2006. Those who cite statistics which appear to show a flat-line trend in overall brain tumor incidence and argue that cell phone use doesn’t cause brain cancer need to examine data on the location and type of brain tumors over time. Alasdair Philips, Denis L. Henshaw, Graham Lamburn, and Michael O'Carroll. 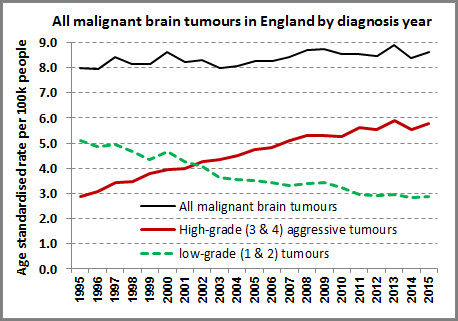 Brain tumours: rise in Glioblastoma Multiforme incidence in England 1995–2015 suggests an adverse environmental or lifestyle factor. Journal of Environmental and Public Health. Article ID 7910754, https://doi.org/10.1155/2018/7910754. 2018. Objective To investigate detailed trends in malignant brain tumour incidence over a recent time period. 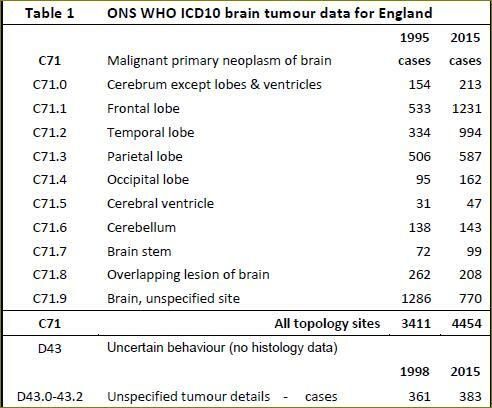 Methods UK Office of National Statistics (ONS) data covering 81,135 ICD10 C71 brain tumours diagnosed in England (1995–2015) were used to calculate incidence rates (ASR) per 100k person–years, age–standardised to the European Standard Population (ESP–2013). Results We report a sustained and highly statistically significant ASR rise in glioblastoma multiforme (GBM) across all ages. The ASR for GBM more than doubled from 2.4 to 5.0, with annual case numbers rising from 983 to 2531. 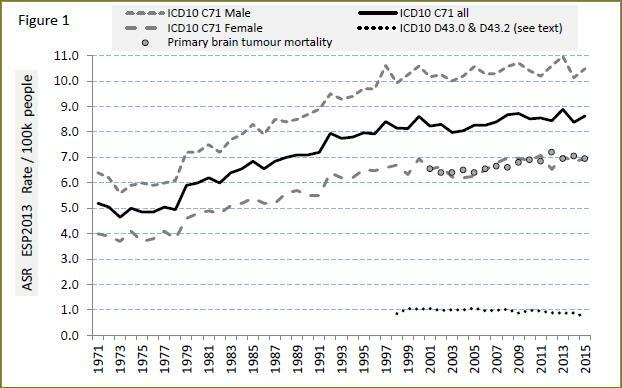 Overall, this rise is mostly hidden in the overall data by a reduced incidence of lower grade tumours. Conclusions The rise is of importance for clinical resources and brain tumour aetiology. The rise cannot be fully accounted for by promotion of lower–grade tumours, random chance or improvement in diagnostic techniques as it affects specific areas of the brain and only one type of brain tumour. Despite the large variation in case numbers by age, the percentage rise is similar across the age groups which suggests widespread environmental or lifestyle factors may be responsible. 1/. We show a linear, large and highly statistically significant increase in primary GBM tumours over 21 years from 1995–2015, especially in frontal and temporal lobes of the brain. This has aetiological and resource implications. 2/. Although most of the cases are in the group over 54 years of age, the age–standardised AAPC rise is strongly statistically significant in all our three main analysis age groups. 3/. The rise in age–standardised incidence cannot be fully accounted for by improved diagnosis as it affects specific areas of the brain and just one type of brain tumour which is generally fatal. We suggest that widespread environmental or lifestyle factors may be responsible. 4/. Our results highlight an urgent need for funding more research into the initiation and promotion of GBM tumours. This should include the use of CT imaging for diagnosis and also modern lifestyle factors that may affect tumour metabolism. The legal limit for the SAR in the U.S. is 1.60 w/kg (averaged over one gram). In many countries the legal limit for the SAR is 2.00 w/kg (averaged over ten grams) which enables the body to absorb 2-3 times the radiation than the U.S. guideline permits.